On 26th March 2018, Google announced on their official Webmaster Blog that for searches completed on mobile devices, they were going to start ranking the mobile-friendly versions of a website's pages more predominantly ahead of its desktop versions, where there might be significant differences between the two. Since then Google have been notifying compliant website owners that their site's pages have been crawled and enabled for mobile-first indexing, and are therefore eligible for ranking in Google's search results on mobile devices. We've all been there when you've done a Google search on your mobile and end up landing on a site whose layout and content is just too small and unreadable to even bother with. Patience wears thin and you end up hitting the back button or abandoning your search altogether. So with around 60% of all searches happening on a mobile in 2018, it's easy to understand why Google are encouraging site owners to take the steps to ensure their mobile users have a good experience. With strong smartphone sales, better internet connectivity and advances in technology, mobile internet browsing is only going to keep increasing. And that means more Google searches on mobile, therefore more of a need for Google to rank sites that provide clear, viewable content that mobile users will enjoy and engage positively with. Your website isn't going to suddenly fall out of Google's search rankings if it's not mobile-friendly, nor it is likely to automatically shoot to the top the minute you've added loads of mobile-friendliness to your pages. It seems that the "most relevant" content will still continue to take priority in search results like it always has, whether it's a desktop or mobile optimised page. 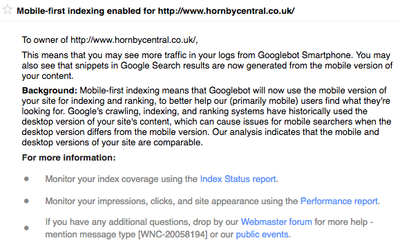 Google have actually released a set of best practices for mobile-first indexing, as can be seen in the table graphic below. 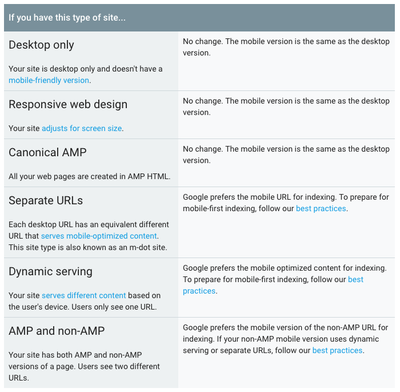 Notice that if your website is responsive, you're already complying with Google's guidelines to an extent. A responsive design means your site adjusts automatically for the screen size and device the site's being viewed on. In other words the mobile version is the same as the desktop version, so there's no need for Google to index and rank separate desktop and mobile versions of your pages. Google are still strongly recommending site owners make their content mobile-friendly as much as they can, and that having mobile-friendly content is still helpful for those looking at initiatives to perform better in mobile search results. They've been evaluating whether content is desktop or mobile compliant since 2015, but are these the strongest signs yet that "mobile-friendliness" may impact ranking factors in the future? Time will tell... but we'd not bet against it. Don't forget though, there are many factors Google use to determine search ranking positions. Fast-loading content is also something Google recently highlighted as being important for ranking... something we take very seriously during web design and build projects for our clients. If you have any questions or concerns about your website being mobile-friendly, or are looking for a digital partner to work with, feel free to drop us a line at hello@adigital.co.uk.